Liquor, fresh fruit and wine easily blend to create a variety of tasty cocktails. 2 What Do You Mix Grappa With? 4 What Drinks Can I Make With Banana Rum? Red wine combines deliciously with fresh fruit and a variety of liquors to create an array of tasty mixed drinks. You can create punches, potent cocktails, martinis and sangria using a combination of these ingredients. The fruit flavors of oranges, lemons, limes and strawberries complement red wine, and also blend well with many types of alcohol. Purchase good quality wine and liquor to ensure that your drinks have a superior taste. There are many ways to create red wine sangria, all with different flavor nuances. The basic recipe calls for two parts red wine to one part brandy. Add fresh cut up fruit like oranges and lemons to the alcohol mixture, then top with lemon-lime soda. For a delicious twist, try adding one half-part of lemonade and slices of fresh strawberries to your sangria. Another variation on the classic sangria is to mix together two parts red wine with one part brandy and one half-part triple sec or another orange liqueur. Add slices of oranges and limes, and top with a half part of ginger ale. Sangria is best served in a wine glass over ice and with pieces of the alcohol-infused fruit floating in the glass. 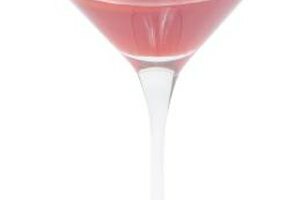 The California martini is made by mixing together two parts vodka to one half-part each brandy and red wine and a dash of orange bitters. Shake all ingredients in a cocktail shaker until blended, then strain into a martini glass. Serve this drink garnished with a wedge of orange. The claret cobbler cocktail is created by mixing together three parts claret wine to one part tripe sec. Stir in a few tablespoons of simple syrup and pour the mixture in a wine glass filled with crushed ice. Top with soda water, and garnish with a slice of orange. To make the smooth cocomacoque cocktail, mix together equal parts red wine, white rum, orange and pineapple juice in a cocktail shaker. Add a squeeze of fresh lemon juice and shake the cocktail. Strain into a tall glass filled with ice, and garnish with a wedge of pineapple. To create a simple wine punch, mix together three parts red wine with one part each of pineapple and orange juices. Add one half-part vodka and slices of orange and lemon. Stir the mixture well, and serve in glasses over ice and garnished with an orange wedge. The cardinal punch is made by mixing together eight parts of red wine with two parts each of brandy and rum into a punchbowl. Add 2 ounces of sweet vermouth and 6 ounces of champagne to add a bit of fizz. Mix in a half cup of sugar and the juice of six lemons. Stir the punch well and garnish with slices of lemon. Mulled wine is a delightful concoction that is perfect for cold winter nights. In a large sauce pan, mix together equal parts water and red wine with one part brandy. Stir in a few whole cloves and cinnamon sticks, slices of lemon and orange and one half-part sugar. Slowly simmer the mixture on low heat for about 10 minutes. You can substitute gin for the brandy to create a different flavor profile by infusing your punch with the earthy taste of juniper. A vin chaud is another warm wine drink, that combines the flavors of the alcohols with honey, strawberries and chunks of pineapple. In a large pan, pour in two bottles of red wine to one part brandy and one part water. Stir in 4 tablespoons of sugar, 2 tablespoons of honey, pineapple and sliced strawberries. Heat the ingredients over low heat for 10 minutes until the flavors are combined and the liquid is heated through. Serve the cocktail hot in goblets, garnished with strawberries. What Kind of Christmas Punch Can I Make With Cranberry Juice?